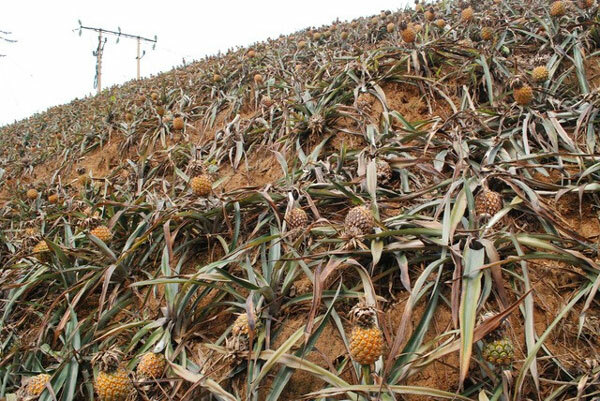 VietNamNet Bridge – Authorities have confirmed emissions from Tu Dinh Joint Stock Company’s metallurgy plant are destroying around 200 hectares of pineapple and other crops in the northern Lao Cai Province’s Muong Khuong District. Last Friday, Dan Tri online newspaper reported that dozens of households in Muong Khuong District were in a desperate situation as hundreds of tonnes of pineapples that were ready for harvest had rotted suddenly. After the local People’s Committee reported the incident, the provincial Department of Natural Resources and Environment inspected the pineapple farms and found that the leaves of pineapple and tea plants were burnt. On inspection, officials found that the metallurgy plant lacked the system to prevent the release of the sulphur dioxide (SO2) generated during the production process into the atmosphere. The plant’s emission treatment system did not meet the standards set for metal production. As a result, when it was cloudy or it rained, the SO2 mixed with water and steam to form the highly corrosive sulphuric acid (H2SO4), damaging all plants and crops in the area, the inspection team said. Around 197 hectares of farms belonging to 82 households have been affected. The inspection team also found that some of the plant’s production equipment, said to be imported from China, has no certificates of origin and quality. On Monday, Le Ngoc Hung, deputy head of the provincial People’s Committee, said Lao Cai has ordered the company to halt operations until it fulfils all legal requirements related to its production and emission treatment system, and submits relevant documents to prove it. The company has also been asked to install a gas monitoring and automatic wastewater controlling system to prevent further environmental damage.